This set of camping pepper spray products will provide an enormous amount of protection for you and your loved ones when spending time in the great outdoors. 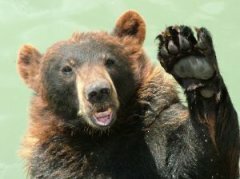 You can protect yourself if attacked by a bear or other vicious wild animals. This could also protect you against an unfriendly person wandering into your campsite or causing problems on a trail. 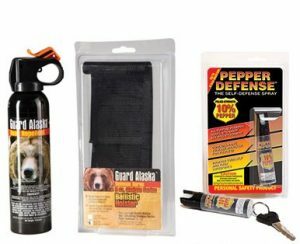 You never know when someone or something could attack, so prepare yourself with one of these camping pepper spray products. With a nice compact size and high capacity, this is a great product to bring on a camping trip. The 35 burst capacity and ten foot range will provide protection against multiple attackers, both human and animal. Using the 3-in-1 formula of Pepper Spray, CS Military Tear Gas & UV Marking Dye, the results are extremely effective. Police and security personal around the world trust the SABRE brand. Features: High capacity allows for protection against multiple attackers, small size is easy to carry on hikes. This is a great combination deal that provides a holster for the bear spray can and a keychain canister of pepper spray, which allows redundant protection and safety to multiple individuals. The range on this spray is quite high, maxing out at 20 feet and nine seconds of continuous spray. A solid four-year shelf life allows you to be protected over a long period of time. Features: Bear spray repellent will help keep bears away from your campsite or local areas, small size is easy to carry on hikes. Also, check out Bear Bells. With a heavy fog that can cover up to a 30-foot range, this spray will help ward off almost any bear that you encounter. The five seconds of constant spray will unload the 7.9 oz. canister on the bear and cause it to be disorientated, giving you time to leave the area and seek immediate assistance. You will get a nice long three-year shelf life with the Frontiersman Bear Spray. Features: High-power bear spray allows for great instant coverage with a 30-foot deployment of heavy fog. Being prepared is one of the most important aspects of camping so why not be on the cautious side and throw a can of pepper spray in your bags. There may be an unplanned encounter that comes up in the future and you will thank yourself for thinking of all possible outcomes and protecting yourself with some quality pepper spray. Don’t gamble with your life, always be prepared and carry pepper spray. 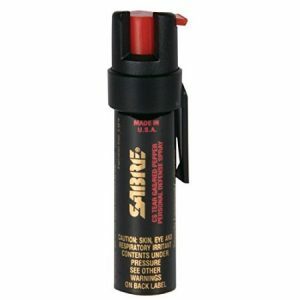 Be the first to comment on "Camping Pepper Spray – Top Picks"